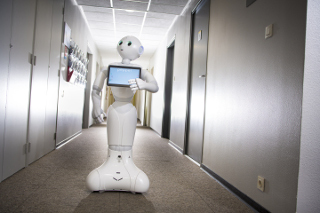 The Rainbow research group exploit some experimental platforms consisting of 5 trays (robotic vision, indoor mobile robotics, medical robotics, humanoid robotics and indoor drones). 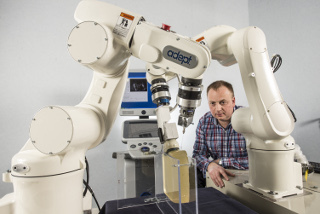 They allow team members to use reliable robotic systems to validate their researches in visual servoing, visual tracking and active perception. From a software point of view, all the materials are controled with ViSP an open source software platform we develop in the team, but also with ROS framework. 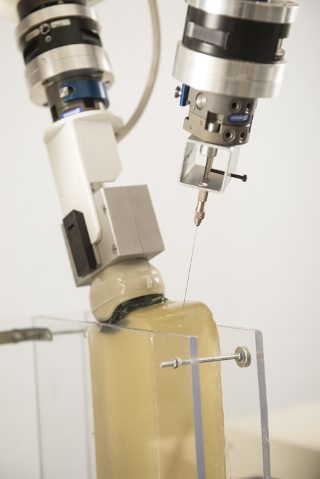 We operate three industrial robots to validate our research in visual servoing and active vision. 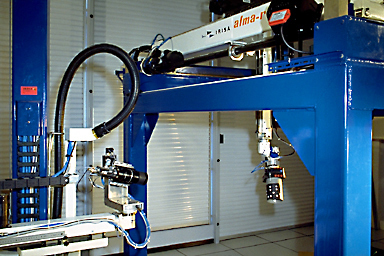 The first one is a 6 DoF Gantry robot built by Afma Robots in the nineties, the other one is a 4 DoF cylindrical robot also built by Afma Robots. 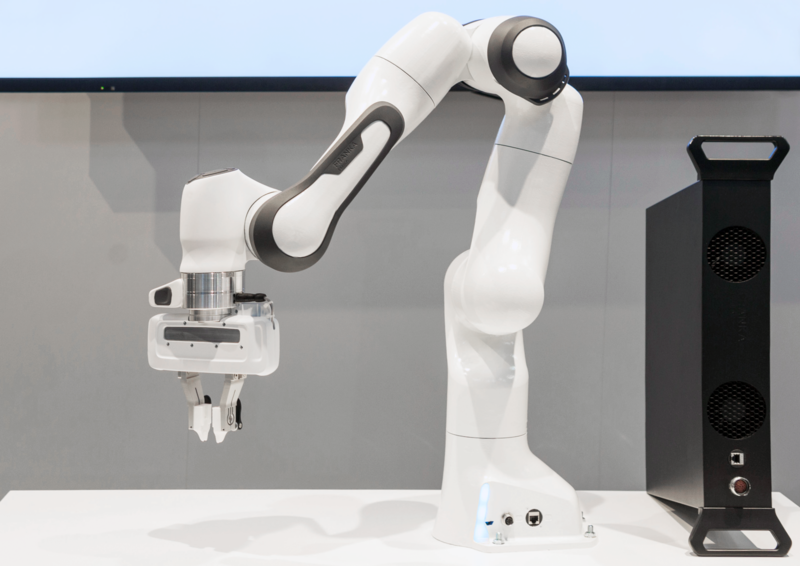 The third is Panda, a 7 DoF compliant robot from Franka Emika. 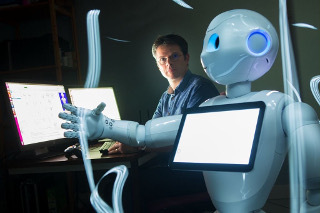 These robots are equipped with cameras. 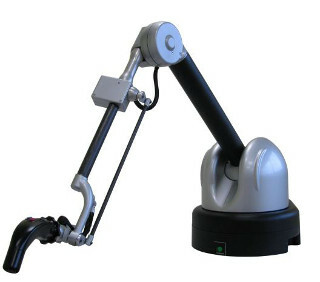 The Gantry robot and Panda also allow embedding grippers on its end-effector. We are also using a haptic Virtuose 6D device from Haption company. This device is used as master device in many of our shared control activities. For fast prototyping of algorithms in perception, control and autonomous navigation, the team uses a Pioneer 3DX from Adept equipped with various sensors needed for autonomous navigation and sensor-based control. 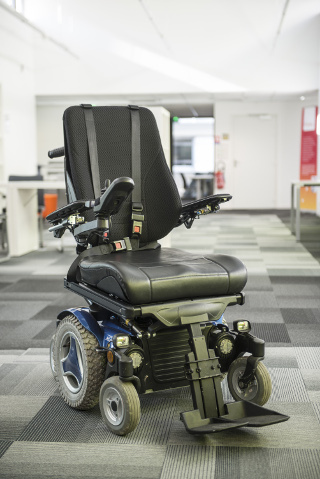 Moreover, to validate the researches in personally assisted living topic, we have three electric wheelchairs, one from Permobil, one from Sunrise and the last from YouQ. 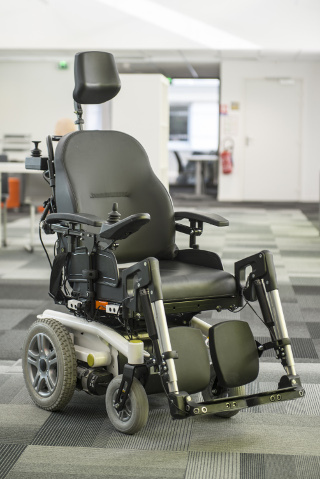 The control of the wheelchair is performed using a plug and play system between the joystick and the low level control of the wheelchair. 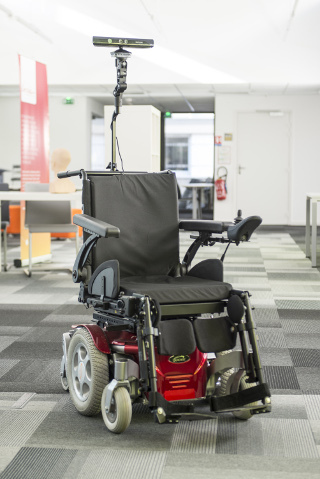 Such a system lets us acquire the user intention through the joystick position and control the wheelchair by applying corrections to its motion. The wheelchairs have been fitted with cameras and ultrasound sensors to perform the required servoing for assisting handicapped people. This platform is composed by two 6 DoF Adept Viper arms. 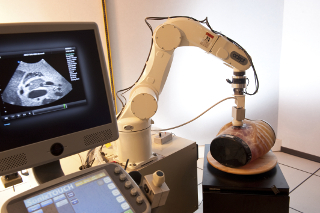 Ultrasound probes connected either to a SonoSite 180 Plus or an Ultrasonix SonixTouch imaging system can be mounted on a force torque sensor attached to each robot end-effector. The haptic Virtuose 6D device from Haption can also be used within this platform. 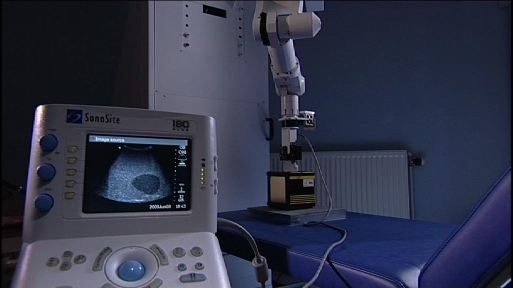 This testbed is of primary interest for researches and experiments concerning ultrasound visual servoing applied to probe positioning, soft tissue tracking, elastography or robotic needle insertion tasks. 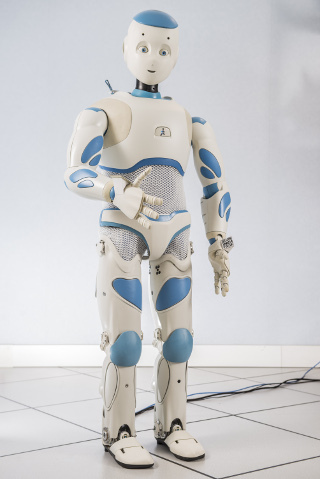 Romeo is a humanoid robot from SoftBank Robotics which is intended to be a genuine personal assistant and companion. Only the upper part of the body (trunk, arms, neck, head, eyes) is working. This research platform is used to validate our researches in visual servoing and visual tracking for object manipulation. 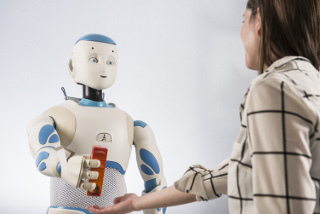 In 2016, this platform was extended with Pepper, another human-shaped robot designed by SoftBank Robotics to be a genuine day-to-day companion. 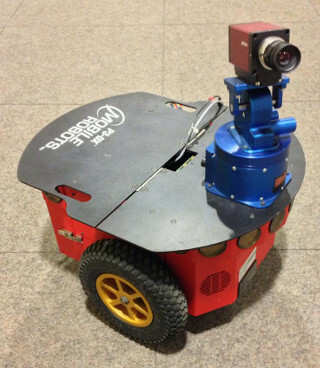 It has 17 DoF mounted on a wheeled holonomic base and a set of sensors (cameras, laser, ultrasound, inertial, microphone) that makes this platform interesting for researches in vision-based manipulation, and visual navigation. From 2014, we started some activities involving perception and control for single and multiple quadrotor UAVs. 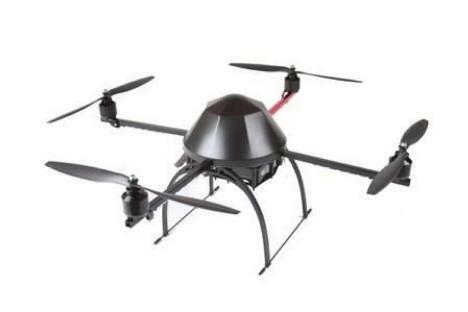 To this end, we purchased four quadrotors from Mikrokopter Gmbh, Germany, and one quadrotor from 3DRobotics, USA. The Mikrokopter quadrotors have been heavily customized by: (i) reprogramming from scratch the low-level attitude controller onboard the microcontroller of the quadrotors, (ii) equipping each quadrotor with an Odroid XU4 board running Linux Ubuntu and the TeleKyb software (the middleware used for managing the experiment flows and the communication among the UAVs and the base station), and (iii) purchasing the Flea Color USB3 cameras together with the gimbal needed to mount them on the UAVs. 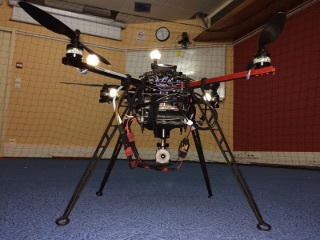 The quadrotor group is used as robotic platforms for testing a number of single and multiple flight control schemes with a special attention on the use of onboard vision as main sensory modality.